For most of us, December 18, 2015 is going to be a very nostalgic moment as we wait in the darkened theater to see Star Wars: The Force Awakens. Regardless of your feelings afterwards, the sensation of sitting down to watch The Phantom Menace for the first time was an experience that’s difficult to put into words. It’s not just fans who have a deep connection to the franchise, but stepping on set the first time had to be a surreal moment for returning cast member as well, and one of them, Mark Hamill, recently talked about that experience. Yeah, the déjà vu of walking onto the Millennium Falcon again and remembering all these details that they’ve got exactly right from old photographs and old blueprints…I can’t describe the feeling. Even now it seems surreal to me. It seems hard to believe that it’s actually happening. Seeing him this happy, he’s almost unrecognizable. Because when I was with him [on the original trilogy], he was fretting over all the details, so he didn’t have time to enjoy himself. To seem him in such a good place, it’s thrilling. Now that Star Wars is completely out of Lucas’ hands, Hamill remarks that now the franchise is the responsibility of people that are fans, who grew up on these movies. He said, “It’s interesting to see someone at the helm who was a fan.” And that’s exactly what director J.J. Abrams and many of the other people involved are. 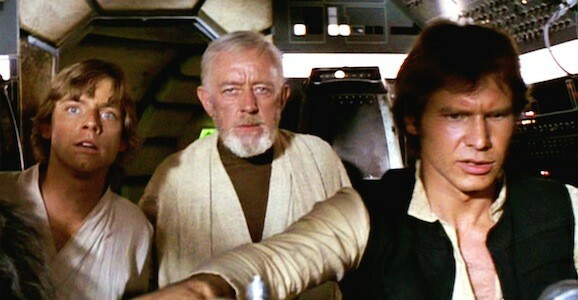 Hell, some of the younger members of the cast and crew have never lived in a world without Star Wars. That’s a whole different kind of pressure than just making a movie, which is already substantial to begin with. As fans, they know just how much this means, not only to them, but to millions of people and multiple generations around the globe. It’s this weight that led Abrams to call making a Star Wars movie “terrifying,” and you have to imagine that it was.